Derek McInnes stressed the result was more important then the performance after Aberdeen beat Hamilton to go five points clear at the top of the league. Adam Rooney's first-half penalty gave the Dons a seventh Scottish Premiership win out of seven, continuing their best ever start to a league season. 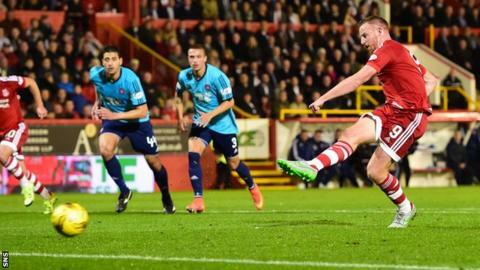 "It was all about the result tonight," McInnes told BBC Scotland after the match at Pittodrie. "If we'd been given that result at the start we'd have taken that gladly." The Dons had opportunities to increase their lead with Rooney having a header saved, Niall McGinn hitting the bar and Josh Parker spurning a chance when one-on-one with goalkeeper Michael McGovern. However, Hamilton Academical finished the game strongly and made it a nervy finish for the home side, who defeated champions Celtic 2-1 on Saturday. "I felt it was a big effort from everybody tonight to get the job done," said McInnes. "Knowing the competitive side of Hamilton we had a job getting on top of them. I thought Hamilton played well tonight and made it difficult for us. "After the excitement, the drama, and the level of performance and the spotlight on the game on Saturday it was good just to make sure we got the three points. "The excursions of Saturday maybe took more out of us than we expected but you don't know that until you see them out there." Aberdeen led the Premiership for spells last season but never pulled away with a commanding lead. "When you're given the opportunity to go five points clear it's important to try and grab it," said McInnes. "We've done it, we've not done it with a polished performance, but we've shown a lot of resolve and there's not a successful team out there that's never had to win games like that. "Last year we were sparkling against St Mirren, scored two goals, then tossed two points away. That was a brilliant performance. "Tonight wasn't a brilliant performance but in that same fixture this year we've managed to win without being great." Hamilton player-manager Martin Canning was pleased with the improved performance of his side following the heavy defeat by St Johnstone at the weekend. "After Saturday the most important thing for me was that we got a reaction from it," he said. "I thought the performance was excellent, towards the end the momentum was with us, and I thought we were a bit unfortunate not to take something from the game. "I've always said if the performance is good the results will follow. If we perform like we did tonight then we can look forward to Motherwell." The decisive goal came from the penalty spot, but minutes later Hamilton could have had a spot-kick of their own only for Dougie Imrie to instead be booked for simulation. "I haven't seen [the Aberdeen penalty] back but from what I've heard it was a penalty, I think he's got that one right," Canning said. "But they were also saying there was contact on Dougie."